The old saying that “when the student is ready, the teacher will appear” rings true over and over again in my life. 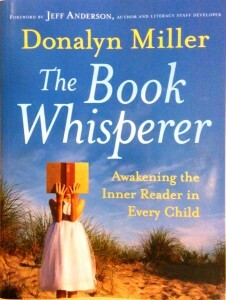 And so it was with Donalyn Miller’s The Book Whisperer. I ordered it some time ago, leafed through it, then promptly popped it into my pile of “books to read” and let it grow dusty for quite some time. 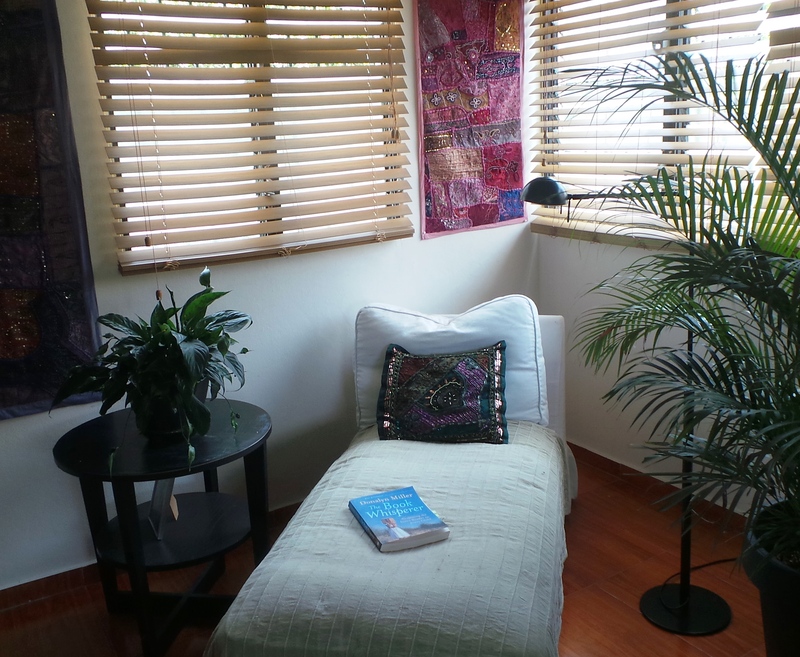 My reading nook at home. I read about the journey she took with her students in reading workshop. She focused on creating an atmosphere that would help all kids develop a love of reading and allow them to mirror what readers do in the real world, rather than completing a series of activities that turn reading into another mandatory chore to complete for school. She decided that reading logs emphasized the “homework-ness” of reading, so she got rid of them. She kindled excitement in her students right from the first day of school with her “book frenzy” (you’ll have to read the book to find out how she creates that magical beginning) and here’s an example of a book frenzy created by one of our teachers. She opened up a world of choice to her students, not only allowing them to choose their independent reading books, but also some of the whole class novels they read together. At the same time, she set very high standards for her students and was clear about her expectations. I feel like I’ve been on the same journey, but she took it further and learned so much faster than I did. Somewhere along the way I got stuck in habits that I knew weren’t working but didn’t have the courage to change. For instance, I’ve known for years that reading logs don’t prove anything – non-readers just fill in fake book titles. And yet it was so hard to give them up. As a teacher responsible for ensuring that dozens of students actually learn, it’s always scary to give up control… how will I make sure the kids are learning? And voila! 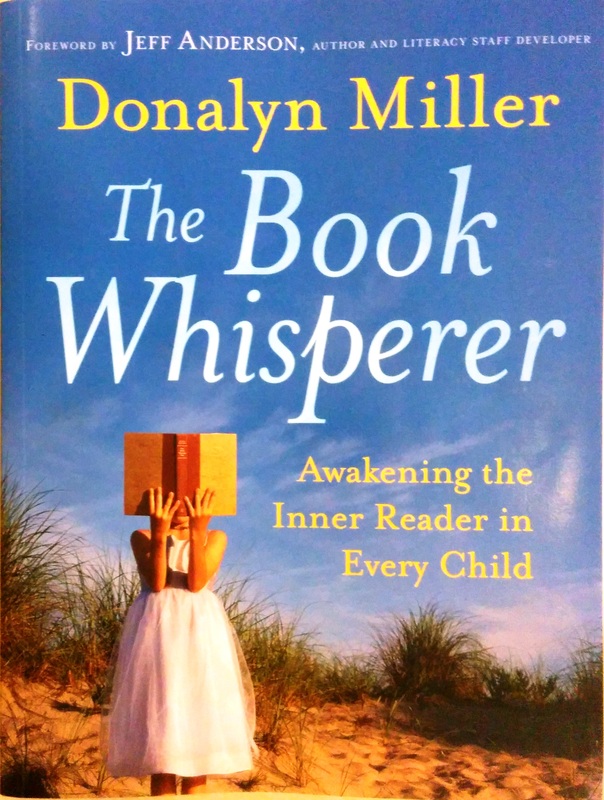 Donalyn Miller to the rescue, with the words it took to get me unstuck. The setting Donalyn Miller creates for reading is inviting, and students are trusted to work independently. She describes a class where different groups of students alternate between reading, sharing recommendations about books, working in their reading notebooks, or preparing a book commercial. While this is happening, she moves around the classroom conferencing with her students. Our classrooms: Although we surround our students with books and allow them the freedom to get comfy while they read, kids tend to work in a much more lock-step manner – they’re all reading, writing in notebooks, or analyzing literature at the same time. I love the feeling of freedom Donalyn describes and want to see our classes move in that direction this year. She noticed that reading logs were a waste of time, so she eliminated them and simply gave students a goal to reach – read 40 (yes, 40!!) books this year. On the other hand, if some students can’t reach that goal, Donalyn doesn’t fret, choosing to look at the positive instead. For example, shell point out to students that they only read 3 books last year whereas this year they read 16 or 22 or 27 books – which isn’t failure, it’s cause for celebration! Our classrooms: In the past school year, we noticed that although our elementary students were voracious readers, independent reading was stagnating in high school so we took steps to rekindle our kids’ love of reading. We started by changing our assessment and getting rid of reading logs (see how we did that here, here, and here). The next phase will be to set motivating goals in Book Whisperer style. Donalyn Miller veers away from book studies that involve the entire class (although she may include a few, she doesn’t spend weeks and weeks asking students to answer comprehension questions and complete art projects). Instead, she says, “use short stories, excerpts, or poems to teach literary elements or reading skills, and ask students to apply their understanding to their independent books.” This makes so much sense! Our classrooms: We definitely teach most of our lessons through shared reading novels, which some kids love and some kids hate. I’m eager to have our teachers move away from this and focus more on independent reading. As easy as this may sound, it will take courage to implement. My favourite chapter is “Cutting the Teacher Strings.” In it, Donalyn writes: “Reading as it is traditionally taught and assessed actually encourages (students) to hate reading.” Agree, agree, agree. But what can we do about it? In the next 30 pages she talks about a series of traditional practices (including whole-class novels, comprehension tests, and book reports) and gives us alternative practices that effectively teach students without killing the love of reading. Our classrooms: In our school we gave up comprehension tests, book reports and round robin reading a long time ago. But we still have other areas to work on – Donalyn’s ideas for rethinking the whole class novel and giving up formal book talks are inspirational. So often we question our practice, but we’re not sure what to do instead. The Book Whisperer gives concrete alternatives to replace traditional activities. Each summer I try to find a professional book that rekindles my excitement for teaching. This year is definitely “the summer of The Book Whisperer” and I’m eager to introduce it to our secondary Language Arts team in September. I’m hoping they’ll agree to do a book study on it and that they’ll find it as inspiring as I do!